I love weight training. There’s nothing more satisfying. It’s hard, and it’ll make you pull some interesting faces – and probably break into a sweat sitting down – but it’s pretty empowering to be safe in the knowledge that you’ve got great upper body strength. Plus, it’s amazing for toning up – meaning combined with a healthy diet, it’s pretty much guaranteed to save you from the evil flab demon. And girls, this is a big thing – resistance training will NOT make you bulk up. I promise. We just don’t have the levels of testosterone to pull that off – meaning that if you stick with it and keep lifting increasingly heavy weights, you’ll be less Incredible Hulk, and more Catwoman. No bad thing. I was asked on Twitter earlier today if I knew of any really great upper body workouts with dumbbells – and I’ll be honest, I had a look through my old bookmarked pages, and alas, nothing stood out. I work out at the gym, because frankly I’ve always lived in places way too tiny to accommodate any gym equipment, and it’s across the road from my house – meaning I don’t use dumbbells very often. But in the interests of research, I thought I’d look into how my upper body workout can be done at home. I like to combine strength training with a couple of yoga poses to stretch out and tone a little bit more – so you’ll find a bit of a mixture here, and feel free to add in anything else that floats your boat! Now I will add (so that nobody sues me) that I’m writing here my own upper body workout – so if you’re new to strength training you should speak to a professional, see a doctor, etc etc. But just listen to your body – if you’re straining too hard, stop. You should be challenged, and doing a rep of 10 should be tricky but not painful – so go at your own pace. With all strength exercises, I aim for three sets of ten reps – but depending on the weights you’re using, you should adapt that to your own strength. Dare you not to feel cool while you’re doing this. Lie down on a stable surface and start with the weights straight up over your chest, with your palms facing out. Bend your elbows and lower your arms down until the elbows are just below the chest, and then press the weights back up – without locking your elbows. In fact, as a general rule, don’t lock anything when you’re doing these exercises. Try to keep everything as smooth as possible. I really struggled with this one for a long time – and it’s still the one I like the least (so I tend to get it over and done with early.) Make sure you sit on a bench with decent back support, and keep your feet firmly on the floor, hip-width apart. 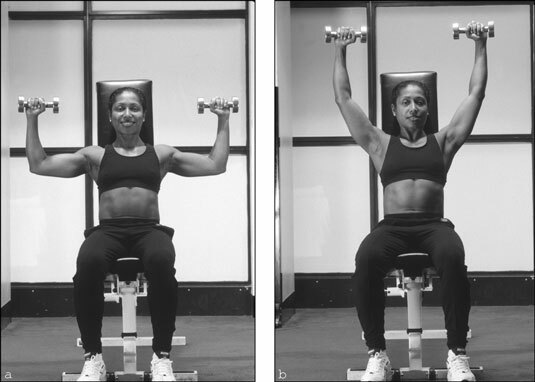 Bend your elbows and raise your upper arms to shoulder height, so the weights are at ear-level. Make sure you pay attention to what your abs are doing (keep them braced) and make sure your head is supported. 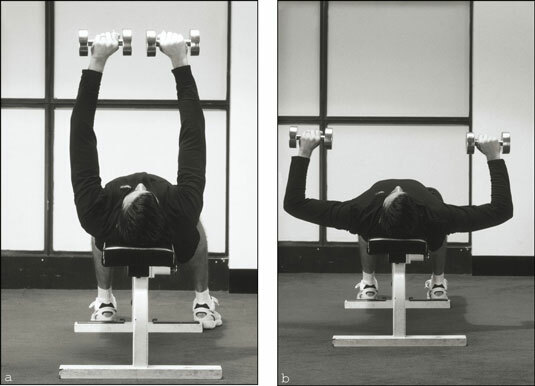 Then push the weights up, directly over your head, and then lower them to ear-level again. Kneel over the side of the bench by placing your knee and hand of the supporting arm on the bench. Pull the dumbbell up until it reaches your ribs, or until your upper arm is just beyond horizontal. Then slowly return your arm to an extended position, so that the shoulder is slightly stretched downward (but you’re not bending forward too much). Do three sets for each arm. No dumbbells here – sit on a bench or chair, and put your hands on the chair by your hips. Lift up on to your hands and bring your hips forward, off the front of the chair. Bend your elbows no lower than 90 degrees and lower your hips down, keeping them close to the chair. Make sure to keep your shoulders down and your neck and head stable. Push back up (again, without locking the elbows) and repeat. Get down onto your hands and knees with the wrists under the shoulders and the knees under the hips. Curl your toes under and push back, raising your hips and straightening your legs. Spread your fingers and focus your strength through the forearms into the fingertips and outwardly rotate the upper arms, broadening the collarbones. Let your head hang, moving your shoulder blades away from your ears towards the hips. Now you’re all set, engage your quadriceps strongly to take the weight off the arms, making this a nice, comfortable pose to rest in – but make sure you stay engaged and pay attention to your body. To make this a bit more challenging, lift one of your legs firmly into the air and keep it nice and straight, and hold. And don’t forget to breathe! Come back to Downward-Facing Dog and repeat on the other side. I love this pose – it’s one of my favourites to end a workout because it feels amazing. Sit on your mat and put your hands on the floor just behind you, with your palms pressed right into the floor. Put your feet on the floor and lift your hips up, leaning into the shoulders so that your arms and your legs are both at right angles to the floor. Let your head sit back, but don’t strain your neck – and breathe. It should be comfortable, but you should be able to feel your upper arm muscles working – and make sure to keep those hips raised for a nice bit of core work too! There are lots of other great upper-body exercises you can do with dumbbells – these are just a few of my absolute favourites. But what about you guys? What are your favourite upper-body workouts? Thanks for stopping by one of my posts! You have a very inspirational story and I’m looking forward too reading more! Congratulations! What you have done is a massive achievement. I am glad to see you are doing resistance training and promoting it to other females. (I like the catwoman line). Resistance training releases the most effective hormones for fat loss and muscle retention. Your lean muscle tissue is also the powerhouse of your metabolic rate. Women have higher levels of oestrogen and catabolic hormones… CV exercise will enhance levels of catabolic hormones, result in short weight loss (more accuraltly muscle wasteage 30% fat 70% muscle) and stall fat loss long term as well as potential metabloic damage if paired with a low calorie diet! Oh my gosh this really makes me want to make a pie. So glad it’s gluten free. Unfortunately I can only salivate over the pictures since dairy and eggs are not options for me right now…Thanks so much for your beautiful blog, it’s one of my favorites.